Happy new year, whoooo! As today’s the last day of my holiday vacation, I wanted to squeeze in a book and kick off 2015. I don’t know how many books you resolved to read this year, but the first one matters, doesn’t it? 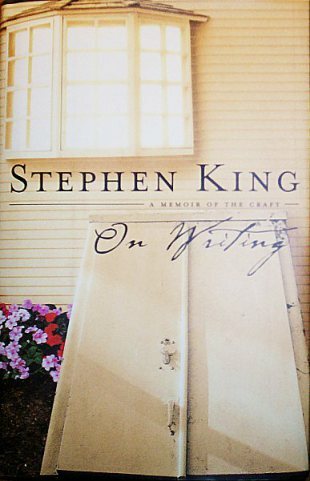 I chose Stephen King’s On Writing, a memoir and writing advice book that I’ve been wanting to read for a while and finally found discounted at Half-Price Books (I love that store). I enjoyed it so much that I finished it within 24 hours — not that it’s long (about 300 pages), but books that grab me like that are hard to come by. A good chunk of On Writing is about Stephen King’s life growing up, which is far from boring. His whole purpose is to show how he as a writer was formed (writers aren’t “made”), and with 20/20 hindsight, he connects certain habits and events from his childhood and early adulthood with the shaping of the best-selling author he became. He was writing long before Carrie, in other words, and although he loved (and continues to love) movies, he learned to turn off the television early in life (it’s a killer to productivity). The other parts of the book deal with his tips on writing and a good bit about his own process, which are probably the most valuable sections. Some of the final pages discuss his accident in 1999, when a man driving a blue van hit him while he was walking on a road in Maine, and how writing helped him through his painful recovery. Probably my favorite section, which is even smaller, is a look at the editing process: King gives you several pages of a story (“1408,” as it happens) unedited and then provides a marked-up version and explains the revisions. One fundamental rule: Omit needless words. Another? Kill your adverbs (those pesky -ly words). Good writing is often about letting go of fear and affectation. Affectation itself, beginning with the need to define some sorts of writing as “good” and other sorts as “bad,” is fearful behavior. Good writing is also about making good choices when it comes to picking the tools your plan to work with. Once I start work on a project, I don’t stop and I don’t slow down unless I absolutely have to. If I don’t write every day, the characters begin to stale off in my mind — they begin to seem like characters instead of real people. The tale’s narrative cutting edge starts to rust and I begin to lose my hold on the story’s plot and pace. Worst of all, the excitement of spinning something new begins to fade. The work starts to feel like work, and for most writers that is the smooch of death. Writing is at its best — always, always, always — when it is a kind of inspired play for the writer. I can write in cold blood if I have to, but I like it best when it’s fresh and almost too hot to handle. Book-buyers aren’t attracted, by and large, by the literary merits of a novel; book-buyers want a good story to take with them on the airplane, something that will first fascinate them, then pull them in and keep them turning the pages. This happens, I think, when readers recognize the people in a book, their behaviors, their surroundings, and their talk. When the reader hears strong echoes of his or her own life and beliefs, he or she is apt to become more invested in the story. Some ideas that King thinks are overrated: writing workshops, characters based on real life (not that you can’t take inspiration from people you know), the phrase “write what you know” (thank you! ), plot (he writes everything from situation and character, but I think that’s a very advanced technique), and theme (it comes sooner or later — don’t sweat if you don’t know it right away, as it follows with the story). A couple tenets he repeats often: Be honest in your writing (even if it will make people uncomfortable). Put the story first. Include only the description details that come to mind. And use the vocabulary you mean to — don’t dress it up to make yourself sound smart. It’s a honest book full of advice that can be hard to hear, but that’s tough love, baby. One thing I’ll note for anyone who’s curious about routine: King says read a lot and write a lot. He admitted to reading around 60-70 books a year, but I think your own pace is just fine. How much should you write every day? As much as you can, but I’ve seen 1,000 words pop up more than once. I think what’s important isn’t the word count you achieve but that you stick with it every day so that you establish a routine — whether that’s with the writing (door closed, as King says) or the editing (door open). Same with reading: Turning off the television and reading regularly helps you get into the right mindset for writing. And resist to the temptation to show anyone your draft until it’s done — or don’t dare talk about it. That’s my advice — like with New Year’s resolutions, if you share that you’re writing a novel, that’s when it dies. So get yourself a copy of King’s On Writing: A Memoir of the Craft this year. And remember, you can read and talk about writing all you like, but the best way to learn it is to do it. For that I went on eBay and bought myself an AlphaSmart Neo. An author I follow recommended it for distraction-free writing, and it’s great. They don’t make them new anymore, but the company still supports it with documentation and so on. 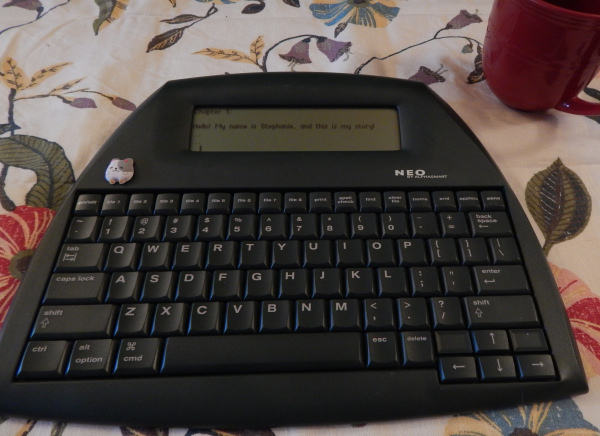 It’s basically a keyboard and a small screen, and it’s good for cranking out a draft of a chapter or whatever (so not for revising). You can’t connect to the Internet, and it’s light-weight (and inexpensive) enough that you won’t mind carting it around everywhere with you. It’s like the Hemingwrite, only more practical and much more reasonably priced (I paid $22, although most I’ve seen are around $40 — Hemingwrites will be $400-500). All you need is the Neo and a USB cord (the one that comes with your computer’s printer should work well). I’ve used it and can vouch that yes, it’s damn good at helping you get the words out. It’s a lot better than staring at a blank white page and that goddamned blinking cursor (how it mocks you). You won’t be tempted to mess around with the font for half an hour. And uploading it to your computer (in any word processor — I use Scrivener) is easy once you find the right cable (B type, 2.0, I believe, but I bought two wrong USB cords before I figured that out). You can’t store thousands and thousands of words, but you can save up to eight different files, and it has an autosave feature and a battery life like whoa (a year at least on three AAs). The keyboard is comfy, and you can adjust the font size and contrast (no backlight, though). Here’s a good Q&A guide. Happy writing (and reading)! What book are your reading first in 2015? One of my favorite books. He does sometimes come across a little snooty, but hey, he’s right in so many ways.